Several New How-to Articles Today! I came across a similar recipe many years ago in a 1930 cookbook. My recipe called for fresh blackberries. I thought it unusual with the sugar syrup and wondered if it would be all mushy, but it wasn’t at all. It was delicious however! Very yummy looking! I love that it has fruit in it – makes it kinda healthy! 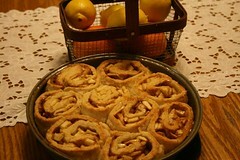 Your Easy Apple Pie Rolls look scrumptious! I will definitely have to try this recipe. So glad I stumbled upon your blog! I’ll definitely visit again soon. I believe I will make these once the weather turns cool. What a delicious treat! What a great recipe idea! Thanks for sharing it. Nice blog. Im happy to have found your exceptionally high quality article! I agree with some of your readers and will eagerly look forward to your coming updates.